Today's Image of Mars is a closeup of a mysterious bright object located at Rocknest on Mars taken by MSL Curiosity's Mars Hand Lens Imager (MAHLI). The image shows an area spanning only 4cm across, which should give you a better idea of how big these bright particles are. 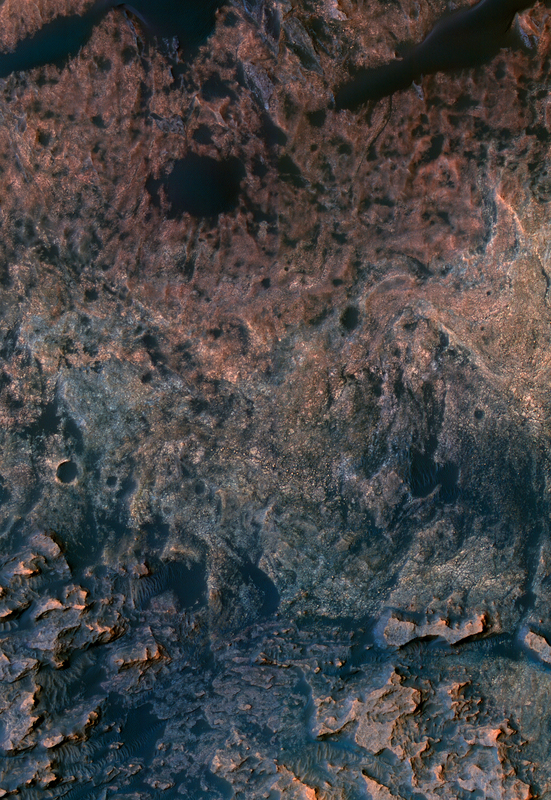 MSL took this image after it had taken a scoop of the terrain. Click this image to see the high resolution image from NASA. The MSL team was originally worried that the bright objects could be a part of the rover that had fallen off, as this has already happened once before, but after further image analysis it was determined that these bright particles are natural to Mars. Mars Science Laboratory Curiosity took this 5cm wide image of the soil just beneath the surface sampled by the rover on 12 Oct 2012 (sol 66 of MSL's mission). 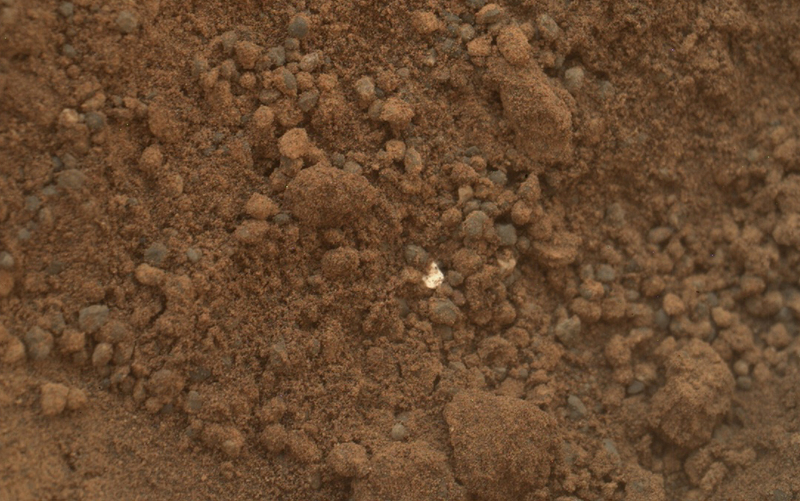 This image showed a bright object embedded in the soil at the top center. Can you see it? Click to see high resolution version from NASA. Because the object is embedded in the soil scientists on the MSL team have determined that the bright object is native to Mars. This comes after MSL saw a similar bright object on the ground next to it. It was determined that that bright object was a piece of the rover that had fallen off. 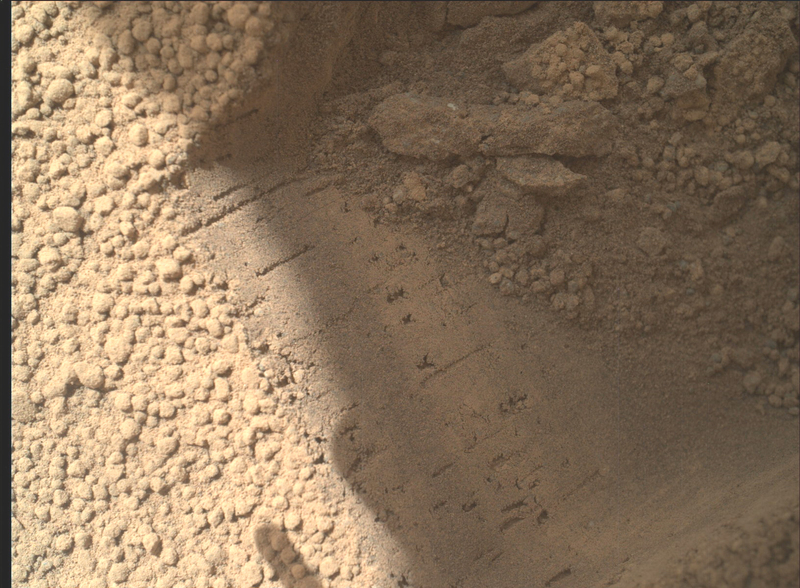 What's different about this is that it appears to be native to Mars, which begs the question, what is this bright object? In the days to come MSL will be examining the area throroughly, which will enable us to better determine what this object is. Stay tuned to find out! Today's Image of Mars is an annotated photo of the rock Jake Matijevic, which MSL Curiosity recently examined with two different instruments. The image was taken on 21 Sep 2012, or Sol 46 of MSL's mission on Mars. Click to see original high resolution image from NASA. The purple circles represent areas where the rover's Alpha Particle X-ray Spectrometer trained its gaze. 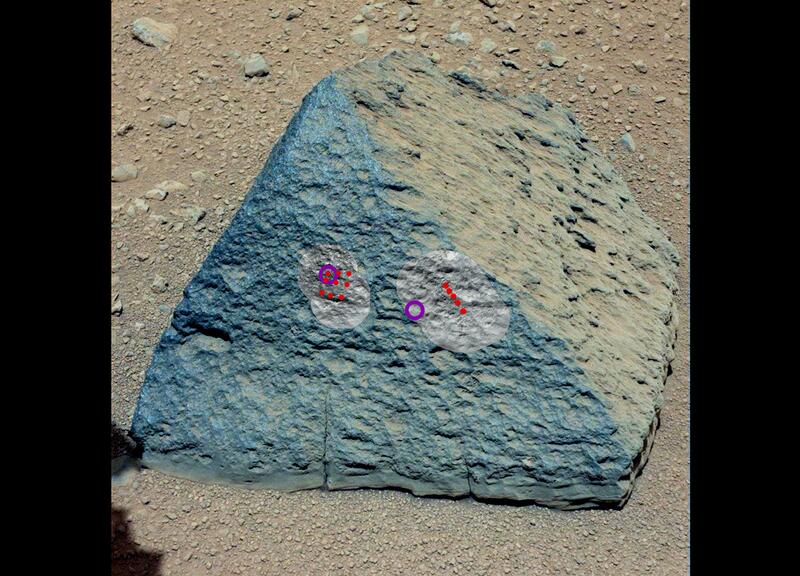 The red dots are where Curiosity's ChemCam zapped the rock with its laser and examined the chemical composition of the vapors. Understanding the chemical makeup of rocks like Jake Matijevic will give scientists a better idea of the environment in which they were created. Today's Image of Mars shows an area at the base of Gale Crater's Mount Sharp where Mars Science Laboratory Curiosity will eventually explore. The darkest colored materials are deposits small grained, windblown sand. The blue areas represent unaltered igneous rock, whereas the lighter brownish-red colors are indicative of the same type of rock altered by what most scientists believe was water. MSL Curiosity's mission is to search for signs that Mars could have once supported life as we know it; examining minerals that have been altered by the presence of water will help us to determine that. Studying the chemical composition of these rocks will provide us with unparalleled insight into the past environment on Mars. 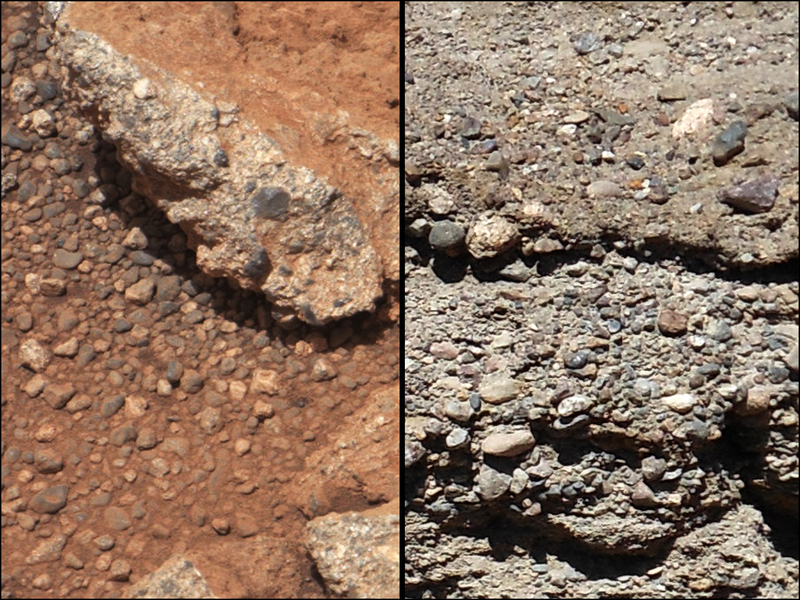 Mars Rock vs Earth Rock - Can You Tell the Difference? 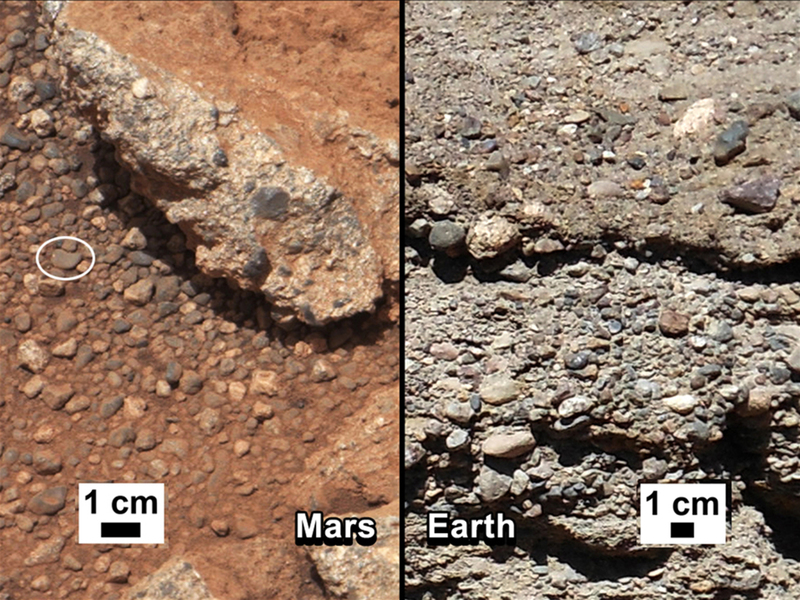 The below image shows us just how difficult it can be to differentiate the surface of Mars from Earth's. This image was taken by MSL Curiosity on 2 Sep 2012, it's 27th sol (Martian day) since it's operation in Gale Crater. Click to see larger, annotated version from NASA.